During the early part of the 20th century, Truckee was one of Hollywood’s favorite sites for making movies. Nearly 100 known movies or movie sequences have been filmed in Truckee and the surrounding area, not including many scenes from popular television series, such as Bonanza. 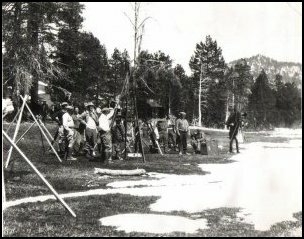 The earliest report of filming in this area was in 1910 when the Truckee Republican reported that the Selig Polyscope Company had arrived in town for the purpose of filming winter scenes to be used to simulate the Alaskan wilderness. It is believed that this was the first movie ever made in Truckee. The film crew of 20 arrived decked out with Alaskan outfits along with sleds, skis and eight Alaskan dogs for a weeklong filming schedule. Winter scenes included heroic rescues by Iceland frontiersmen and Perry's expedition to the North Pole. Truckee had already become a popular winter recreation area and the town’s location along the railroad lines and ample accommodations made it an ideal area for filming. Film crews and equipment could be hauled to the summit or to remote locations in wintertime and the area’s alpine beauty provided a perfect backdrop for outdoor scenes. In March 1925, a movie set version of the Yukon's Dawson City was built on the opposite town [bank] along the Truckee River for the filming of "Winds of Chance." This necessitated the hiring of 300 extras to portray crowds of gold rush "sourdoughs" for the picture. Similar sets were constructed for filming "The Gold Rush," starring Charlie Chaplin which was filmed mostly around Donner Summit and "The Call of the Wild," starring Clark Gable, filmed on a special set constructed near Prosser Creek. Construction work became plentiful as film directors demanded large sets, complete with streets, saloons and cabins, providing employment to many local folks. Film crews kept the hotels and rooming houses filled. The Truckee Motion Picture Association was formed. The group elected Cecil Edmunds, manager of the Public Utilities District, as president; Karl L. Kielhofer, as general manager; Charles B. White, manager of the local bank, and Elizabeth C. Bavier, publisher of the Sierra Sun, as secretary. The strategy paid off. Soon, filmmakers began arriving ever more frequently to film scenes in both summer and winter. The movie companies hired many locals, promising exceptionable wages for extras and laborers. Soon Truckee residents became accustomed to their contacts with film stars who walked the sidewalks, ate at the restaurants and stayed at the hotels in town. They saw them as actors before the cameras and as "real people" when off camera, affable and easy to meet, despite big names and huge salaries. Film stars such as Tom Mix, Mary Pickford, George Bancroft, Buster Keaton, Greta Garbo, Tom Mix, Buster Keaton, Wallace Berry, John Barrymore and Will Rogers became familiar figures in town. In later years, Henry Fonda and John Wayne made visits to town while filming in the area. While making the silent film epic, "The Iron Horse," director John Ford insisted on such authenticity that he hauled an old locomotive over Donner Summit on skids, just as the Central Pacific had done in 1867, with Chinese laborers and 50 head of horses. Movie historian William Everson considered the movie to be "one of the biggest westerns from any period . . . splendidly staged and edited." In 1928, Universal Studios were in town making sequences for “The Michigan Kid.” Child actors came to portray the movie’s principals and the Truckee grammar school was used as their studio, with Truckee kids utilized as extras. In 1953, the filming of the John Wayne classic, "Island in the Sky" created a lot of excitement in town. The film was about an Air Force transport plane forced down on the bleak wastes of Labrador and the efforts of a rescue squadron to locate the plane in the frozen desolate area. Most of the filming was done at the old Truckee airstrip, which, at the time, was located south of present Interstate 80, directly opposite today’s truck weigh station. The film co-starred Lloyd Nolan and Ward Bond who arrived with a 57 member film crew, which was housed at Donner Lake Lodge. In all, more than 100 actors and technicians were in town during the filming. The late Nelson Stone, a longtime Truckee resident, was hired as a technician and worked on the set at the old airstrip. Stone believed that the title for “Island in the Sky” was inspired by the deep fog bank that often appears in the morning at the base of Boca Hill. On certain days the layer of fog creates an illusion that makes the top of the Boca hill look like a beautiful mountain island suspended in the sky. From the earliest silent films to the current blockbusters, Truckee has provided an excellent place for location shots. Today, popular film stars still visit town, not only for making films, but also to enjoy the area’s year-round recreation and fine restaurants. In 2014, one of our readers discovered a misspelling of the actor's name, Wallace Beery. It was mistakenly spelled Berry. Our thanks to this reader who brought this to our attention. Link. As we discover additional movies that have been filmed in and around the Lake Tahoe / Truckee area, we will be adding them to this list. If available, each movie is linked to the Internet Movie Database, IMDb, or the source of information as to the locale of the movie. *** One of our researchers came across an undated flier from W.L. 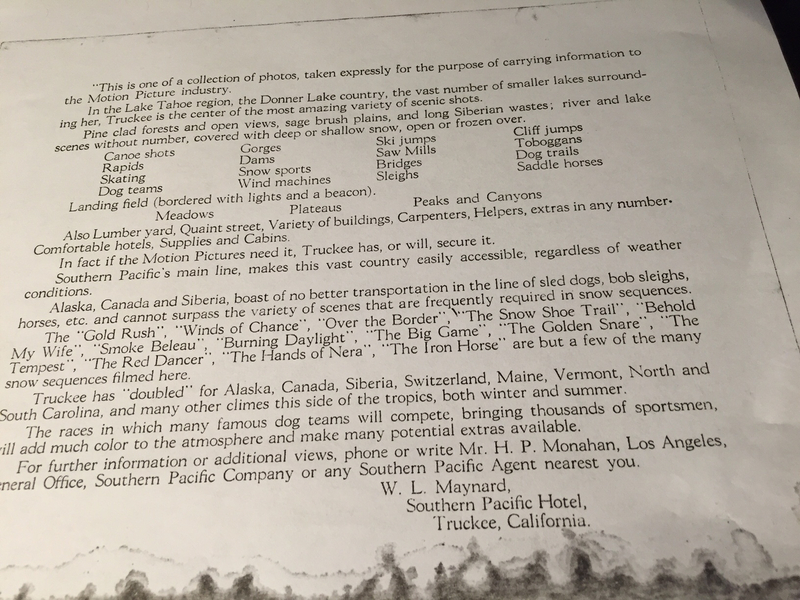 Maynard, Southern Pacific Hotel, Truckee, CA advertising Truckee as a location for movie making. The flier included a number of films that were filmed here in the 1920s, and we believe this flier was issued sometime after 1929.